The Marketing tools in Control have been enhanced to make your salespersons' jobs as easy as possible. 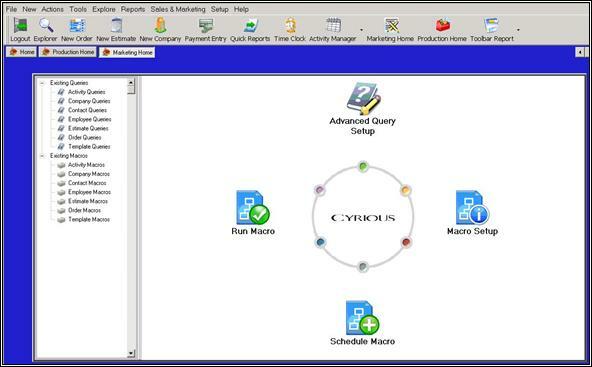 The addition of marketing dashboards and instruments makes running regular macros and queries much easier and faster, and you still have the advanced explorer functionality if you prefer that method. 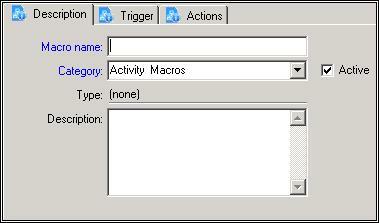 Setting up macros has been simplified as well. For more explanation on how to use the marketing dashboards and instruments, please take a look at the Control 4.2 Marketing Enhancements Reference Manual. Marketing is a vital part of any business and the Marketing Home is designed to help manage this aspect of your business easily and effectively through the use of macros and queries. Close – Closes the Marketing home screen. Macros make it easy for your salespersons to stay on top of their prospects. 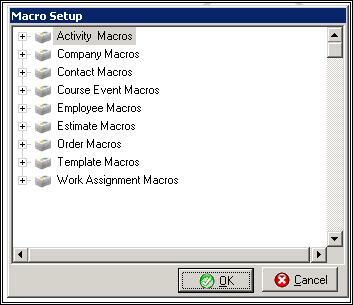 Macros are automated actions Cyrious performs to remind them of potential orders and other updates. 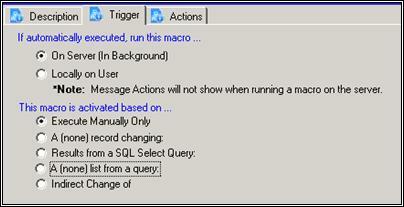 Macros can also be in the form of message windows that pop up whenever a specific action occurs. One macro most Users like to have is a message box confirming that the User wishes to save changes to or delete a record. Our example above is a macro set up to notify the User when a payment is successfully processed. Save – Saves the Macro. Cancel - Cancels any changes made to the Macro. Macro Name Enter a name for the newly created macro. Category Choose a category for the newly created macro. Active If this box is checked, the macro is active. Type Displays the type of macro. Description Enter a description for the macro. Detailed descriptions are best. They will help you keep better track of your work later. Choose whether to run this macro for all on the network or only for the User who created it. 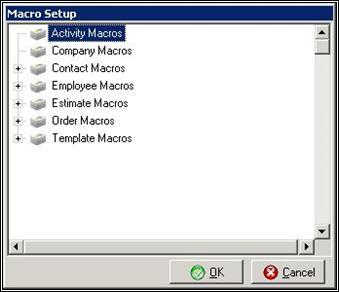 Choose whether to activate the macro manually, or when a company's record changes. If selected, select the Company from the box below. Action Name Enter a name for the new action. Active If this box is checked, the action is active. 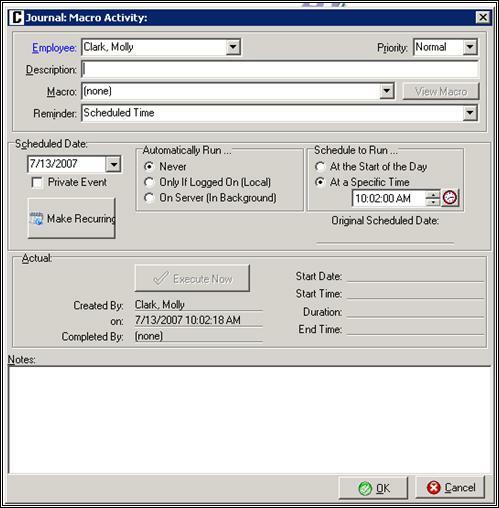 If this box is checked, each time the action is completed, an activity will be added to the User's calendar. Message Text Enter a message that will pop up on the User's screen when the macro runs. It is not a bad idea to schedule a few daily macros. Suppose your Accountant is slightly absent-minded. You might want to set up a macro reminding him/her to close out the financials every day at 4:45 PM. Let us apply this example to the descriptions below. Employee Select your Accountant's name from the list. Priority Designate a priority for the macro. I.e. a priority of Urgent will play a sound and flash a red exclamation mark. 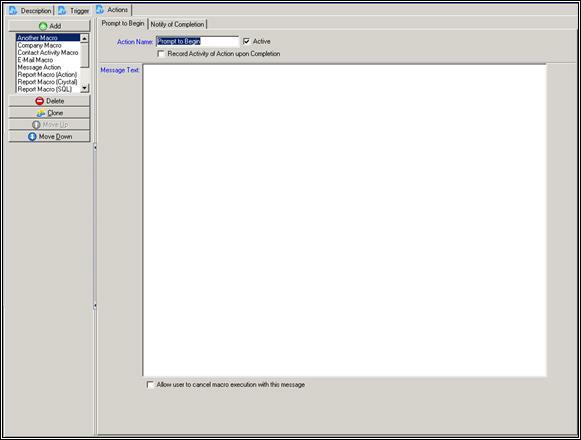 A priority of Normal will show a typical Windows message box. Description Enter a description for the macro. In this case, you would put something like “Perform Daily Close Out”. Macro Select the macro you want to run. View Macro After you have selected an item from the list, click on View Macro to play it. This ensures you have selected the right one. Reminder You can set a reminder for this macro if desired. In this case, you would select Scheduled Time. Scheduled Date Begin the macro today. Private Event If it a private event, the reminder will only appear on your Accountant's screen. However, the activity will still show in his/her Activity Manager for others to see. Make Recurring Click this button to make the item repeat. Choose to make this one every day, Monday through Friday. Automatically Run … We want our accountant to close out every day, so we will select Only if Logged On. Schedule to Run … As mentioned above, we want the Accountant to close out every day at 4:45 PM. This is where you would enter that time. Original Scheduled Date Displays the first date for which the event was scheduled. Actual Displays unchangeable information pertaining to the item. Notes Other specific information about the macro. By clicking on Run Macro, a pop up screen will open. You can select a macro to run manually. Clicking the button to the left of the selection box will bring up an existing advanced query. The screenshot above shows the query information that is shown after selecting an existing query. 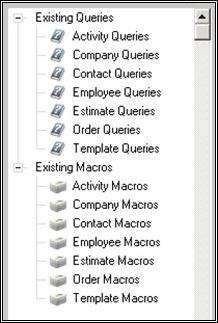 The query name, category and type will all be shown, as well as the query itself. 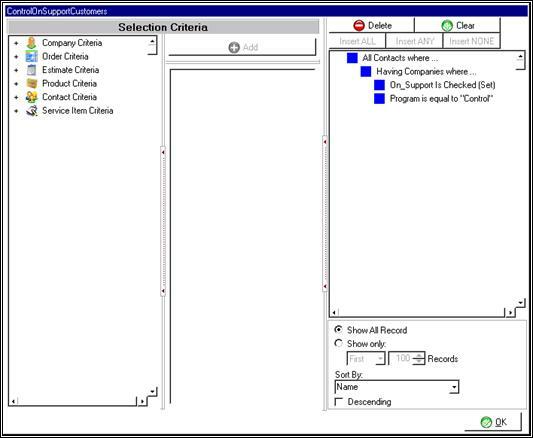 This screen is where you will choose the criteria that will make up the query you are setting up. Be sure to choose the category that best fits so others can access it as well. The special actions toolbar allows the user to perform certain functions. Below is each action that can be performed and what each action does. New Group Creates a new group. New Item Creates a new item in the query.